This week we’ve been reflecting on the paradigm shift that occurred in hip hop ten years ago. The year 2007 was the year Kanye outsold 50 Cent and the rap game changed forever. But Graduation and Curtis were not the only significant releases of 2007. That was also the year of Shop Boyz’ “Party Like a Rockstar” and Soulja Boy’s “Crank Dat” and Hurricane Chris’s “A Bay Bay” and UGK’s “International Players Anthem.” And then, amidst all that, an unlikely masterpiece leaked onto message boards from somewhere in California: Blu and Exile’s Below the Heavens. 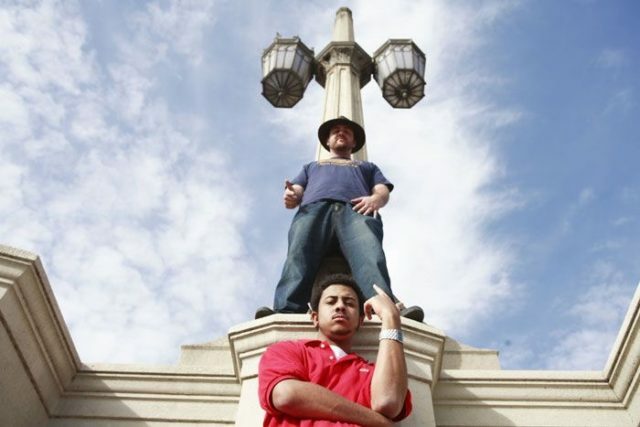 Ten years later the San Pedro MC and the Orange County producer —currently in the midst of 42-date 10th-anniversary tour—are now announcing the October 20 release of a new project: In The Beginning: Before The Heavens, the prequel to their 2007 underground classic Below The Heavens. Comprising unreleased tracks from the original Below The Heavens sessions, In The Beginning picks right up with that same energy, and features appearances from Aloe Blacc, Co$$, Donel Smokes, and Blame One.